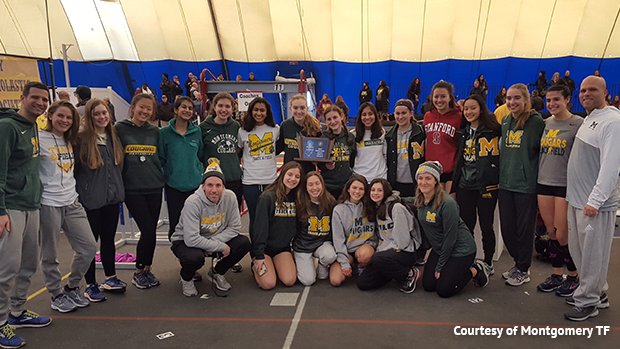 The Montgomery girls, led by Caroline Mehlhorn's distance double, won its first title and the South Brunswick boys captured its second title at Saturday's NJSIAA Central Jersey, Group 4 Championships at the Bennett Center in Toms River. Mehlhorn, a freshman, led the charge for the Montgomery girls by winning the 1,600 (5:0-6.43) and 3,200 (11:11.34) as the Cougars outscored South Brunswick, 57-49 1/2. South Brunswick was bidding for a fifth straight title. Montgomery had several athletes contribute to its historic victory. Abrianna Barrett won the high jump at 5-2 and was fifth in the hurdles, Sarah Witt placed second in the 400 in 59.99, Annie Hathaway was second in the pole vault at 10-0, Chilly Wallace placed third in the hurdles (8.90), Elizabeth Henderson was sixth in the 3,200, and the 4x400 team finished fifth. In the boys competition, South Brunswick, which outpointed runner-up Freehold Township, 62-51, won its first title since 2014 by using a great all-round attack. Miles Liggins had a big day for the Vikings. The senior won the 800 in 1:59.22 and was second in the 400 in 50.83. Also for South Brunswick, Javier Santiago won the pole vault (14-6). Vidhur Polam and Brandon Diaz finished 2-3 in the 3200, Malcolm Yarber was second in the hurdles (7.69), Ola Porbeni took secod in the 55 dash (6.67), Joseph Carlson was sixth in the shot put, Joshua Cella was sixth in the hurdles, and the 4x400 team finished fourth.